Susan has lived in Fairfield County, Connecticut for the past twenty six years and has had a private practice for the last twelve years. She received her Ph.D. in social psychology from Columbia University. As a mediator, she specializes in how group dynamics, personality, and gender differences affect family communication and conflict resolution. Formerly an Instructor at the International Center for Cooperation and Conflict Resolution, and Adjunct Associate Professor of Psychology and Education at Teachers College, Columbia University, for five years she served as a mediator for court appointed custody and visitation cases for Community Mediation Services in New York City. 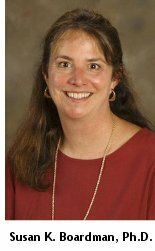 Susan is co-editor of The Journal of Social Issues volume "Constructive Conflict Management: An Answer to Critical Social Problems", and co-author of Paths to Success. Another publication, "Personality and Conflict", appeared in The Handbook of Conflict Resolution: Theory and Practice, and "Peacemaking in Marriage" appears in The International Encyclopedia of Peace. Her most recent work, "Marital Mediation: A Psychological Perspective" can be found in Conflict Resolution Quarterly. She was a member of the Board of the Connecticut Council for Divorce Mediation and Collaborative Practice for five years, and has been teaching, training, and conducting research in conflict resolution, mediation, negotiation, and communication for over twenty years.